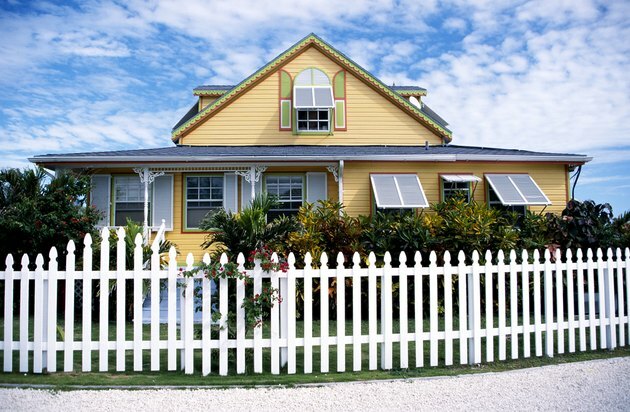 A prefabricated gate can be one of the most expensive parts of your wood fence. Fortunately, you can use an extra fence panel to build your own custom gate for a fraction of the cost. Wood fence is easy to cut and alter, so creating a gate out of the fence is actually fairly simple. With the right tools and a little know-how, you can transform an ordinary panel of fence into a fully functional gate. Determine how wide your gate needs to be. If you have an opening in your fence for the gate, use a tape measure to measure across the opening from post to post. The width of your gate will need to be about an inch less than the measurement of the opening. Determine the proper width for your gate and mark the measurement on the rails of your fence panel. Use a circular saw to cut the fence panel to size. Cut between the vertical pickets of your panel--do not cut through them. Only the horizontal rails of the fence need to be cut. Guide your saw between the pickets to cut through each of the rails. Take another wood rail, preferably one that matches the rails on your panel, and lay it diagonally across your gate. It should extend from the bottom right of your lowest rail to the top left of your highest rail. Cut the new rail to length if needed, then attach it to the rails of your gate. Use a power drill and wood screws to secure the rail to the fence. Drive screws through the rail into each of your gate's rails. This will provide a bracing for your gate to keep it from sagging. Screw a set of hinges into the face of your gate. Your top hinge should attach through the top rail of your gate, and your bottom hinge should attach through the bottom rail. Have someone help you lift the gate and hold it in the opening of your fence. Hold the gate an inch or two off of the ground and attach the hinges to your fence post. Screw the hinges securely to the post as someone helps you to hold it flush against the post. Attach the latch to finish your gate. Latches are separated into two parts: a simple latch piece and a catching mechanism. First, screw the catching mechanism to the post opposite from the hinged post. Next, hold the latch piece against your gate and line it up with the catching mechanism. Screw the latch into place and your gate should be complete.